US Mail Supply carries Florence Versatile 4C mailbox suites which are designed to meet or exceed the USPS specifications outlined above and in the *Federal Register/Vol. 69, No. 171/September 3, 2004/Rules and Regulations POSTAL SERVICE, 39 CFR Part 111, Standards Governing the Design of Wall-Mounted Centralized Mail Receptacles. ADA Compliance – the USPS 4C Standard includes a requirement to meet Americans with Disabilities Act** (ADA) standards. (See pg. 53,809*) The ADA section that covers clear space and reach dimensions is noted below and can be found here. 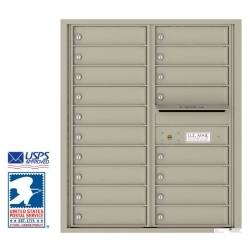 Shop USPS approved mailboxes available for sale from U.S. Mail Supply.